The legendary exhibition Archigram experimental architecture 1961-1974 first went on show in Vienna in 1994. After travelling half the world, the exhibition has now arrived in Rotterdam. Models, installations, panels covered in drawings – all projects by the English Archigram group exudes the popular culture so typical of the 1960s. 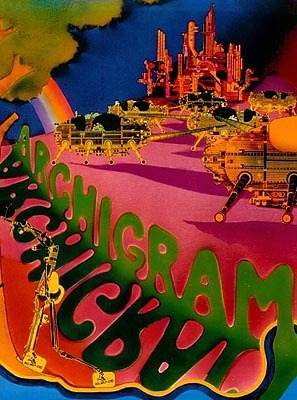 Archigram started out as the name of a stencilled magazine whose first issue – which sold 300 issues – appeared in 1961. The name Archigram, analogous to words like telegram and aerogram, was an implicit reference to the transitory nature of the mag. Compiled by David Green and Peter Cook, it included projects by Michael Webb and a poem by Green. With Archigram, Cook and Green wanted to create a podium to publicise their own work and that of other young architects. Work not published in professional journals because, according to Cook and Green, it fell outside the modernistic canon. Archigram 2 appeared a year later. In 1963 the informal collaborative group of Green, Cook and Webb expanded to include Warren Chalk, Dennis Crompton and Ron Herron. Together they worked on an unrealised exhibition 'Living City': 'our belief in the city as a unique organism underlies the whole project'. The appearance of Archigram 4 in 1964, which featured 'Living City', signalled a breakthrough. An enthusiastic architecture critic, Reyner Banham, introduced the group to a wider audience. To him Archigram offered an alternative to the then prevailing views. They claimed that architecture was more than just building, that the scale of the city needed to be taken into account in design, that the city is more than a series of buildings, and that living should be considered as a logical continuation of human emancipation. Employed in offices during the day, Green, Cook, Webb, Crompton, Herron and Chalk spent their evening hours working in different formations on designs of various scales. When in 1969 the Archigram team (now composed of Cook, Crompton, Green, Herron, Colin Fournier, Ken Allisson and Tony Rickaby) won a limited competition for a leisure centre in Monte Carlo, the core members decided to set up an independent practice. Five years later the practice was disbanded. In those five years Archigram succeeded in realising only a few small projects, among them the 'Instant Malaysia' exhibition design in the Commonwealth Institute in London (1973: Crompton, Herron), a children's playground in Milton Keynes (1973: Crompton, Herron), and a swimming pool for Rod Stewart at his house in Ascot (1973: Crompton, Herron with Diana Jowsey). The world in which Archigram situated its projects was futuristic and apocalyptic. Explicable given the fact that the Cold War raged and the space race was in full swing. The buildings designed by Archigram are high-tech in appearance. 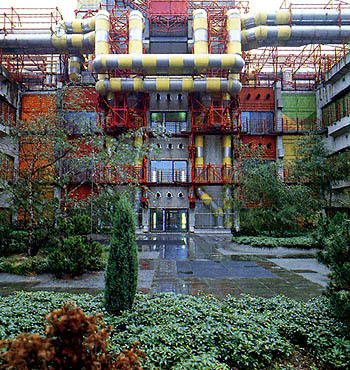 The same visual language can be found in realised works like the medical faculty of the University of Aachen (1968-1986: Weber, Brandt & Partners) and the Centre Pompidou (1971-1977: Renzo Piano & Richard Rogers). 'The pre-packaged frozen lunch is more important than Palladio,' claimed Cook. It is fantastic that almost all the work by Archigram can be seen together in Rotterdam in an exhibition designed by former Archigram member Crompton. It is regrettable that the exhibition is unaccompanied by explanatory texts. The visitor learns nothing about the ideas of Archigram, about the various projects, about the collaborative aspect of the group, the significance of Archigram, and so on. The publication Concerning Archigram, an abridged and adapted version of the official but out-of-print exhibition catalogue A Guide to Archigram 1961-1974, offers some pointers. Archigram compiled the exhibition and both catalogues, and they thus lack independent and critical reflection. Archigram are doing everything within their power to prolong their mythical status as avant-garde heroes for as long as possible, and they're doing it in style. Archigram experimental architecture 1961-1974 is on show through February 3, 2002, at Westelijk Handelsterrein, Van Vollenhovenstraat 15, Rotterdam (5 minutes walk from the Kunsthal). Open Tuesday through Saturday, 10 a.m. to 5 p.m., Sunday from 11 a.m. to 5 p.m., closed on December 25 and January 1. Unclear whose site this is, though it contains extensive information, but patience is required. The Work & Culture website contains an introduction by Eleonora Louis and Toni Stooss.